The eighth day of the year is Elvis Presley’s birthday, so Assignment #8 on our list of 365 Things to Do in Memphis is to celebrate! There are tons of ways to enjoy Elvis’ birthday in Memphis, including attending the official events at Graceland, or making pilgrimages to important places that tell his story: Graceland, Rock ‘n’ Soul Museum, etc. Check out the whole list of ways to celebrate this year right here. Another way to celebrate Elvis’ birthday in Memphis is to visit the King’s humble beginnings. Before Elvis was a big deal, he was a high school kid living in the Lauderdale Courts apartments with his parents. He lived in the small, two bedroom apartment from September 1949 to January 1953 while he attended Humes High School. Today, Lauderdale Courts has been transformed into Uptown Square, a community of classy condos and upscale apartments, but you can still tour (and spend the night in) Elvis’ old digs, which have been decorated as they would have been when the Presley’s were in residence. You can visit Lauderdale Court’s Facebook page to find out how to take tour or see availability for the room. 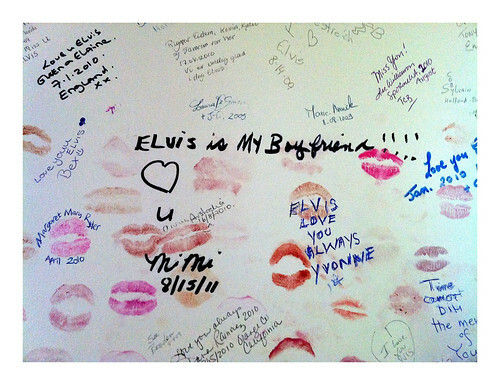 Bonus assignment: put on your lipstick and plant a kiss on Elvis’ bedroom wall. Originally published 2012. Top photo credit: Vasha Hunt.